Is TCHC selling the wrong houses? Should Toronto Community Housing be slapping “For Sale” signs in front of the 56 houses that City Council approved for sale last March? They have the power to do so, now that Ontario’s Minister for Municipal Affairs and Housing Kathleen Wynne has given her consent. But before they do, I hope they will take a sober second look at the houses on their “for sale” list. TCHC has never made that list public. But just looking at the vacant TCHC homes in my neighbourhood shows that it’s an eclectic bunch. Take the house on the left, for example. I can only guess what the interior looks like. But from the outside, it appears to be irreparable. It’s badly located too – a semi-detached house on a busy street wedged among apartments and commercial buildings. 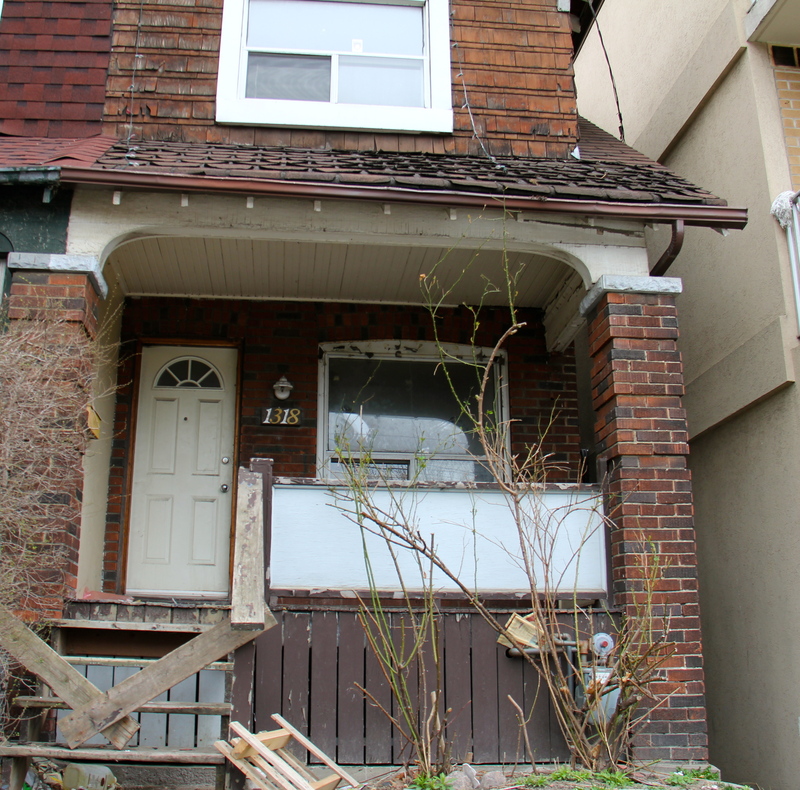 Even if the sale of this house won’t earn much money for TCHC, its life as a home seems to be over. Time to sell and move on. But look at the house on the right: a nice-looking home in respectable condition on a quiet residential street in the heart of Ward 30. A daycare and elementary school are a block away, with an excellent high school two blocks away. A community health centre organizes community gardens nearby. Bus and streetcar lines are two minutes’ walk away, and there’s a subway stop within a 10 minute walk. 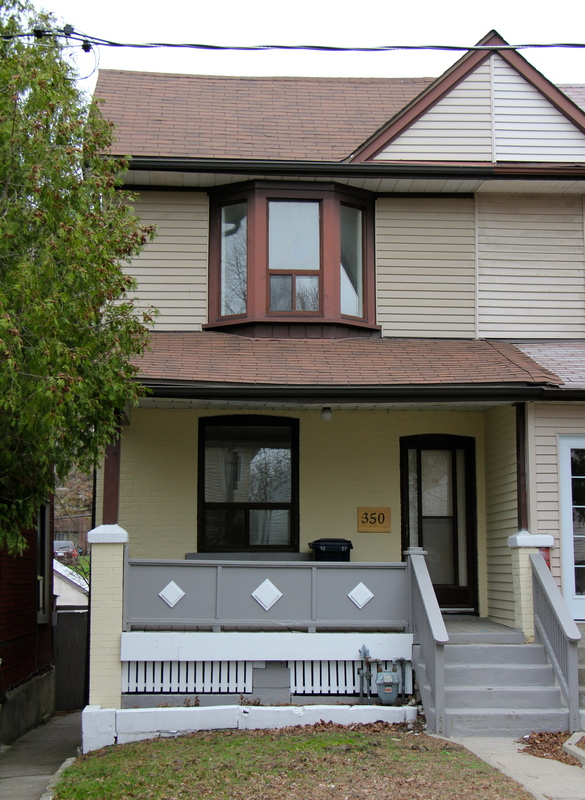 This is exactly the sort of home that Toronto’s low-income families need: integrated, affordable and close to services. It’s also in an old working class neighbourhood where property values rose 21% last year. If we hope to retain any family-sized affordable housing in downtown Toronto, this would be a good place to start. This house is also among the cheapest to manage. Some of TCHC’s houses truly “stand alone.” Of Toronto’s 44 wards, seven have only one TCHC house, and another four wards have five or fewer houses. This isolation can make the houses hard to service. Not this house. TCHC owns at least 138 other houses in Ward 30 – 21% of its stand-alone stock – with another 131 in Ward 32 next door. Other non-profit and co-op housing providers have had great success managing clustered housing just like this. Don’t want to go the rental route? This house is also an ideal candidate for affordable home ownership. If its outstanding mortgage is anything like the rest of TCHC’s houses, it could be purchased by someone earning between $30,000 – $60,000 using the Homesteading model outlined in this blog, or through other affordable home ownership schemes. 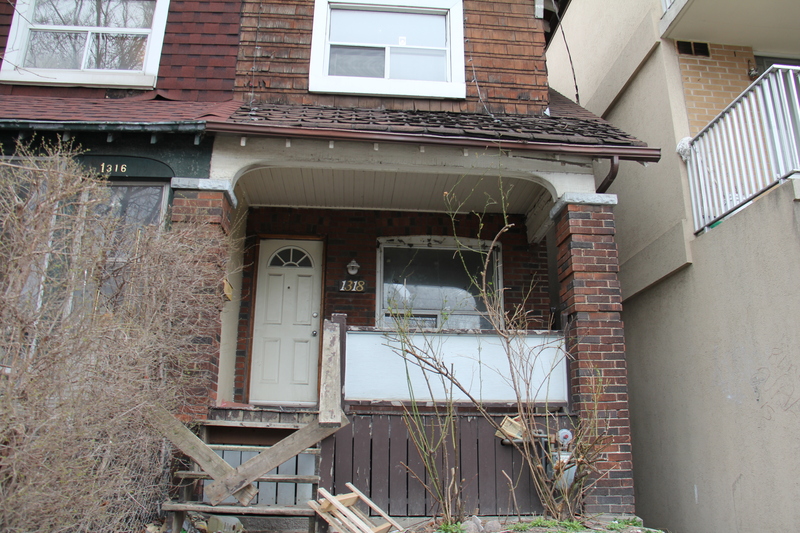 Both these houses landed on TCHC’s “For sale” list for one reason only: they happened to be vacant last spring when Toronto City Council deliberated on the future of TCHC’s stand alone stock. There is no evidence they are the best houses to raise the $24 Million TCHC hopes to earn from this sale. There is also no evidence that selling houses is the best way for TCHC to raise money to repair the rest of its housing stock. That’s because a one-time fix can’t bridge TCHC’s $100 Million annual budget shortfall. As I’ve demonstrated in this blog before, even if TCHC sells off every house it owns, it will merely fend off the decline of the rest of its portfolio by three years. And then what? And as for getting a quick $24 Million to do repairs right now? At City Council Executive Committee meeting on February 17, 2012, TCHC’s CEO reported Toronto Community Housing has $175 Million in reserves. TCHC doesn’t need to sell houses to get cracking on its capital repairs. It can use the money it has in the bank right now. That is why Minister Wynne wisely recommended waiting for Councillor Bailao’s Working Group to complete its research before making irrevocable decisions. It’s what TCHC should do now. Of the 675 TCHC properties on the “for sale” list, Appendix A, City Manager’s Report to Executive Meeting on January 24th, 2012. ← Jungle City? Or company town? to raise Market rents and evict everyone, so they can make condos. Joy: The list of TCHC stand-alone units proposed for sale is available – on the City of Toronto web site and on the TCHC web site. Thanks for the info, Mary. I have seen the list of houses that Councillor Bailao’s Working Group is considering, but not the list of the 56 houses City Council approved for sale. If you have the link, could you post it here for everyone’s benefit? I have been on the tchc housing wait list since 1995 and all I keep hearing is add more buildings. I have tried contacting my mp and city councilor with no luck. I am desperate to get into subsadized housing but told unless I am terminally ill or a battered spouce there is nothing that can be done and now with, tchc selling off properties I wonder how much longer I will have to wait. Since TCHC amalgamated in 2002, there has been a witch hunt to evict to get ride of Subsidy altogether. Selling 675 freestanding houses is the plan to pay for repairs to 30 plus old buildings.. The waiting list will get longer and the waiting will be longer as Subsidized housing disappears. I know for a fact Market rents are priority now to cover expenses with TCHC. That is the sad fact that, not too many people can afford market rent . Since there is no new plans to builsd new buildings that are subsadized what are people like me to do? As pointed out, the waiting list is getting longer everyday and people on social assistence and odsp and such are only given a maximum amount for their rent and it is not nearly enpogh for market rent and some of the rental prices out there, plus not alot of landlords will rent to people on government assistence. So I ask you, the people who are in chardge of rents and the tchc wait list what about us? There are alot of people who are in desperate need of housing and I do not see any ploitician doing much to help. I ask and challenge anu ploitician municipal and federal to listen to the people , the very people who vote, the very people you claim to care about and do something to help us. Now anout the ministry of housing policy, unless you are a battered spouce or terminally ill there is no priority given, there are circumstances in where that shold be looked at. What about victims of violence where you are not a battered spouce where is the help and priority for that, especially where it is a matter of health and safety, there people matter and they should be helped especially when there is proof, they have a right to affordable and safe housing. Agian I challenge the ministry of housing to do something to help thoes people.